Kidney stones are stones formed from chemicals in urine that crystallize and stick together. Stone formation is a gradual process and the tendency in a susceptible person (such as those with a family history) persists throughout life. Concentrated urine predisposes to stone formation while dilute urine diminishes the chances. 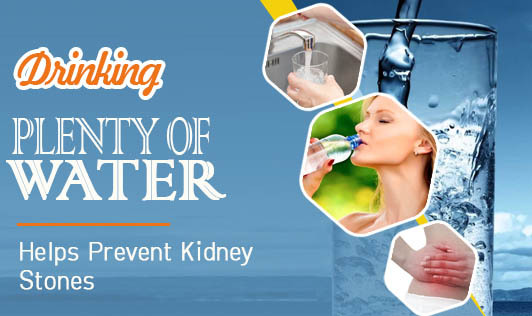 Drinking 10-12 glasses of water or more per day helps to prevent formation of kidney stones. Other fluids like tender coconut water, barley water, fruit juice and light tea can also be had in order to ensure the passage of over 2000 ml of urine per day. The simplest guide is to drink enough fluids to see that your urine is very light in colour. Dilute urine avoids concentration of solids and also tends to make the urine neutral, thus preventing the acid or alkaline reaction which predisposes to precipitation of crystals.